SteamPunk Glass: Steampunk power walking? A Sterling idea! With most of London taking a stroll into work this morning, I thought I’d mention something that has been percolating in my mind for a while. I have been thinking about making something entirely for myself for a change. For ages I’ve fancied getting a really nice walking stick. This is not because I am infirm and need one - although when I’ve done the odd twisted ankle or sprain I’ve certainly wanted one - it’s entirely for vanity! Many years ago when I seemed to spend more time ‘dressed up’ in various historical (or should that be hysterical?) costume, normally Victorian or Edwardian. The one part of my outfit that was always missing was a nice walking cane. Friends had charming silver skull or Faux ivory dragons topped ones, where I went without - even when I severely damaged the back of my right leg and ended up limping for months. For one thing I didn’t fancy carrying it, preferring to keep my hands free, also some of the ‘Ladies’ who went to these events tended to be a little ‘aggressive’ when they ‘borrowed’ any canes/swords/artificial limbs etc that were left laying around. Seemed best not to increase the available weaponry! Of course the other problem was finding one I liked, something with that personal touch. I’ve seen pictures of various Steampunk themed contraptions built into canes, normally fantasy weapons – not for me thank you! 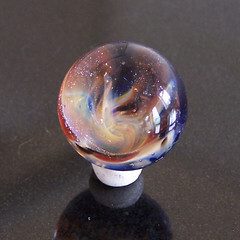 I certainly want to build in some nice glass elements though, I have been wondering for ages what to have as a handle before I started making marbles; now it’s obviously got to be a BIG galaxy marble!!! One thing I originally wanted to add was a sterling engine. This is a strange Victorian heat pump engine that is like a steam engine but uses low pressure air expanding from a heat source one side, then cooled on the other. I have seen a great design that is powered by heat of a hand or surplus heat from a VCR, however they are quite large, and very expensive kits to buy! I am not sure if my engineering talents are up to it either, but I did like the idea of harvesting waste heat from my hand to cool the handle by conducting it down to the cold tip of the can, whilst helping cool my hand! I certainly will include some high tech energy harvesting green technology, some devices that convert small amounts of energy such as the strike of the cane tip on the ground, small amounts of sunlight, the general movement etc, to do interesting & useful things like power built in torches, lights, spinning zoetropes etc. Maybe even a fake sterling engine too! Alternately I might just try something simple with elegance rather than eccentricity in mind. Now that I’ve told everyone I shall have to make it happen rather than just thinking about it!! http://www.reuk.co.uk/Make-a-Stirling-Engine.htm Basic info, plus a little movie of an engine powered by a hot cup of tea!!!! http://www.stirlingengine.com/ A great site with amazing kits and ready to go models too, lots of videos and pictures of their ‘hot tea’ and hand warmth ones running. This sounds an amazing idea. Yes, now you've mentioned it everyone will want to see the end result! But even with 'just' a glass cane top, it would still look pretty amazing.